The Totten team is committed to Quality, Excellence and Communication. We are a husband and wife team that handles all the real estate functions of the business. Our office is located in Carefree Arizona and we are proud to be with Realty Executives International. I started my career in Southern California working for my uncle’s construction company. I had the opportunity to purchase his company and in doing so I got a contract to build a hotel in Phoenixes West Valley. My wife and I immediately fell in love with Arizona it’s open spaces, Blue skies, Plush Green Deserts, Lakes and Rivers only an area that one could dream of. 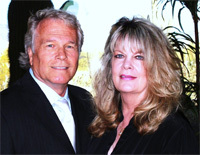 We moved to Arizona in 1980 and started our real estate career along with our construction company T’s Construction& Development Inc. My wife Nancy and I have a full service company our clients like the fact that we have the ability to work with Residential and Commercial properties being a Residential and Commercial Licensed Contractor. Our team fully understand and Protect our Clients both our investors, homebuyers and commercial buyers. Having experience 30 years in the Construction and Real Estate Industry, Buying, Building and Selling our own projects we can both Protect, Guide and Help our clients to Success. Nancy and I are here to HELP buyers sellers and investors. THE ABILITY TO REMODEL OR BUILD THROUGH T’s CONSTRUCTION.